The ArcView Group presents The State of Legal Marijuana Markets as the definitive source for market sizes and high-level analysis of business trends in one of the fastest growing markets in the US. 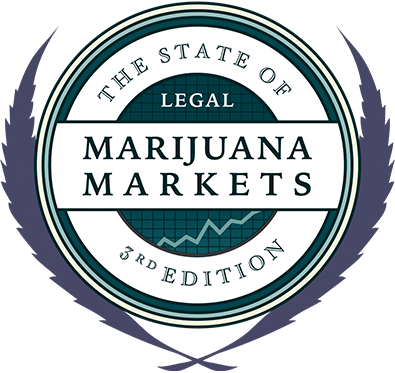 Click here to learn more about ordering the The State of Legal Marijuana Markets. This 35 page report by GreenWave Advisors, provides a county by county recap and analysis of historical sales trends, and calls to attention the inherent evolution of consumer spending preferences in a dual marketplace, as the easing of recreational use restrictions has disrupted the growth rate of the medical marijuana market. Click here to learn more. It's a multi-billion dollar growth industry many investors thought we'd never see; a once-in-a-generation buying opportunity that's still in its true infancy stages. MoneyShow has created The Complete Guide to Investing in the Cannabis Sector. Purchase yours today for a chance to get in on the ground floor, and enjoy growing returns as the cannabis industry evolves and its products become more commonplace. Click here to learn more. As seen in the Wall Street Journal, Forbes and Harvard Business Review, Marijuana Business Daily’s Factbook is packed with financials and business stats for the marijunana industry. Use your copy to create an MJ business plan ... impress investors ... compare your revenues & profitability to the norm ... and evaluate regional risks and opportunities. Click here for more information. In this episode of the Cannabis Financial Network’s Thought Leaders Series we talk to Mr. Steve Berg with the ArcView Group and Editor of the 2nd edition of the State of Legal Marijuana Markets. This CFN interview with Kurt Wolf, managing partner at enVision Business Consulting tackles the issue of delivering customized business solutions to commercial, government and non-profit organizations.